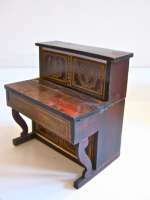 Lovely small metal dollhouse piano Biedermeier with fine gold stencilling. Antiker kleiner "Boulle"-Kleiderschrank mit Spiegeltür für Puppenstube. Goldfarbener Schablonendruck. Der kleine Kleiderschrank hat eine verspiegelte Tür zum Öffnen. Er ist mit Schablonendruck verziert und mit weiß eingelegtem Holz, das Elfenbein simulieren soll.. Höhe 11,2 cm, Breite 7,5 cm. Guter Zustand. Altersspuren an den weiten Bändern. Um 1880 in Waltershausen hergestellt. 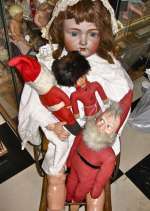 80 cm / 31" is this rare large sized bisque doll.Jointed wooden body from Kämmer & Reinhard/ Simon and Halbig,Germany.Brown eyes, open mouth with 4 teeth, brown long original mohair wig.On wooden jointed body. The Bisque in fine condition. She is dressed in her old white cotton dress with a bonnet, leather shoes and underwear. The body is in good condition, but with wear to the surface. No cracks or restoration. Tiny bisque Dollhouse dolls or toys for the nursery. These dollhousedolls are so sweet and so tiny! 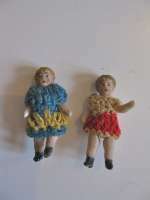 Made of bisque, dressed in their original outfits, jointed at shoulder and hips. 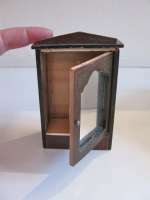 Excellent as toys for the larger doll house dolls! Size 1,2" ( 3 cm) Ca 1910. Note the price is for one doll. What a charming all bisque maid in typical 20-ties dress and hairstyle. She has lovely bent arms and movable legs. Her coiffure and painting is so fine and characterictic for this period. Her eyelids are so lovely molded. 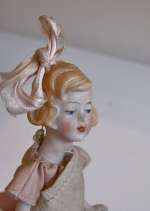 Her large original bow in the hair adds to her charm, She is 4 1/3" 11 cm. No cracks. A lovely doll. 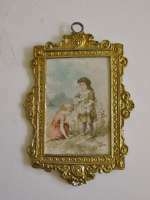 Victorian picture og girls playing.Golden frame. Victorian picture of children playing. Soft metal frame. 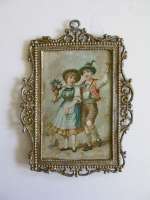 This is a lovely print in soft colors of a boy and girl playing.It is framed in a soft metal filigree frame. Size 3,5" x 2,5" ( 9 x 7 cm) All original.And excellent condition. Eine schöne kleine frühe Pferdekutsche. Sehr schöne Farben und sehr schöner Zustand. Deutschland um 1915. Unbekannter Hersteller, möglicherweise Metz & Duncker, Deutschland. Länge 22 cm.